The Moultrie Team saw more foot traffic than ever at the Moultrie Booth at the Indiana Convention Center during the 2017 ATA Trade Show. At the show, the Moultrie Team announced its new products for 2017. Tons of excitement arose around Dan Moultrie’s personal new Signature “S”-Series. The first of the S-Series is the S-50i trail camera, and visitors raved about the slick Realtree Original pattern, blazing trigger speed and longer battery life. We released additions to our popular All-Purpose “A”- Series, including the A-30, A-30i and the A-35, all which offer improved image sensors to improve image quality for day and nighttime images. The new Feed Station Pro created quite the commotion at ATA, being all the perks of Moultrie’s top-selling Feed Station gravity feeder with an upsize, holding 80lbs of feed. If you loved the original Feed Station, but needed a larger unit, the Feed Station Pro is for you. Our new Directional Feeders anchoring the front of the booth drew crowds each day. The combination of Moultrie durability, outstanding throw potential of 45 feet, and unique designs kept the questions coming. The buzz from the Directional feeders derived from those that need a heavy duty feeder that won’t spook mature bucks. 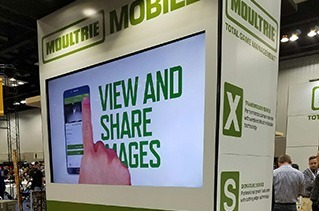 Of course, Moultrie Mobile continued last year’s momentum into this year’s show. The entire 2017 camera line-up works with the MV1 Modem, and the Moultrie Team even hinted at an all-new integrated unit slated for early summer release. Not only that, but Moultrie Mobile has a slew of updates coming this year – many of which are based on user feedback.